Yahoo and MSN are on a mission to produce un-fathomable amounts of content on the Web. Yahoo's acquisition of Associated Content -- since rebranded as Yahoo Contributor Network -- relies on thousands of freelancers (just about anyone can participate) to supply a never-ending stream of content. Yahoo pays for that content, albeit not very much. For the freelancers, speed is the name of the game. The more that can be produced, the more one can earn. One of the consequences of this model is that much of the content can be of questionable quality. MSN has an entirely different problem; one of usability. For one, many of the story links on MSN.com look something like this: "Bing: German dog births 17 puppies". Click on that one and you get search results, not an actual story. In fact, any time you see "Bing:" followed by a story title you will get search results after a click. A quick scan of the MSN home page today shows that linked search results account for five of the first 10 "stories" on the home page. And that's not even accounting for the entire right side of the page which is all linked search results. This is hardly "content." But the worst is in the form of the content itself -- excessive links, promotions and downright trickery. MSN, as it stands, is the worst offender. The image at right is taken from the MSN.com website. The familiar content slider is split into three parts. On the right you see an ad, in the middle is linked content and on the left are images. But a closer examination shows that the middle section is actually an overlay coming from the ad, designed to look like content. It doesn't stay there long, but long enough to be mistaken for content -- long enough for a click -- even by a Web veteran such as myself. That tricky ad didn't seem to last long, thankfully. I haven't seen it in weeks. Perhaps the folks in the editorial department suddenly remembered something about ethics in journalism and click fraud. So what about the actual stories? Below you will find a screen capture from a recent story about the top earning actors in Hollywood, linked from MSN.com. Sounds interesting, doesn't it? It would be, if one could reasonably get through the entire article. The first two sentences contain three highlighted links (in hot pink, no less). 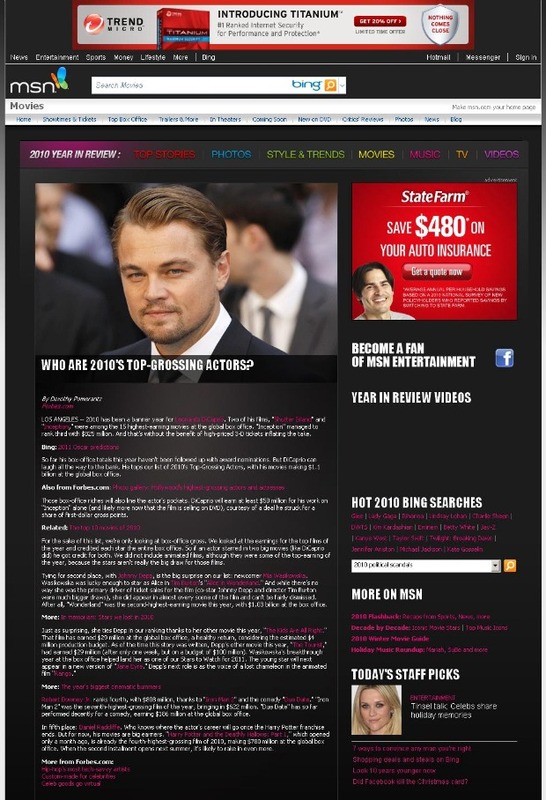 After the fourth sentence is another recognizable distraction: "Bing: 2011 Oscar Predictions". Two sentences later, another interruption: "Also from Forbes.com: Photo gallery: Hollywood's highest-grossing actors and actresses". And so it continues throughout the article. All told, this piece of content contains 21 links. Five of those links break the content flow itself. That's one very difficult article to read on a very simple topic. It appears that the drive for content (Yahoo and MSN) and search (Bing) are literally dominating their respective Web properties, and superseding the user experience. It's soiling the Web. And the Web is already messy enough. The last thing we need is it to be useless, too. This is why I have come to appreciate smaller, simpler and cleaner Web properties. And I know I'm not the only one.